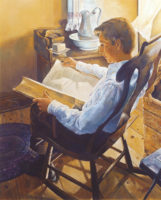 The following was written by Mary Ririe for the LDS.org blog. To read the full article, click here. I was starting a new semester of school, and my only goal was to survive the semester with decent grades. Doesn’t seem like too lofty of a goal, yet it was becoming more and more difficult. I was feeling increased dizziness, fatigue, and nausea, but I was unfazed (mostly just in denial). Every morning I woke up at 7 and dragged myself to class, feeling sick to my stomach and experiencing major brain fog. By the time I finished classes at noon each day, I was wiped. I knew I should stay on campus to study and finish my homework, but every day I hit a wall of exhaustion, and I had to go home and take a nap. My naps consumed my whole day. Often I would wake up 5–6 hours later, even more stressed out about everything I had to do. And no matter how long I slept, I still felt just as exhausted. I had recently returned home from a mission where I had been sick with mysterious illnesses over and over, and each time I had received strength by relying on my Savior and I had been healed. I came home a transfer early and was able to find some answers before returning to school, but as the semester became more intense, I found my worst nightmare was coming true. My sickness was returning. Within three weeks, I was diagnosed with Lyme disease. There are many emotions that come with receiving a diagnosis after months of sickness that is hard to define. On one hand, I was so relieved. Relieved it wasn’t just in my head or something I was imagining. Relieved I had a path to follow. But the more I learned about my chronic illness, the more I learned that very often it had no set treatment, and it would probably take years to get my life back. As the weeks wore on, treatments commenced, symptoms got worse, and my goal to survive the semester with decent grades seemed impossible. As I considered withdrawing from my classes, I was at a loss. Here I was, thousands of miles from home with the sole purpose of attending school and getting my education. If I didn’t do that, who was I? What role would I play? Would my life have any meaning? What would fill my time? Would I be judged for taking a break? I was 22 and physically unable to go to school, to work, to even maintain a healthy social life. It was like God had pressed a pause button on my life, my hopes, my dreams. I felt stuck, unable to progress, unable to have any amount of control of my life—in the present and even in the future.